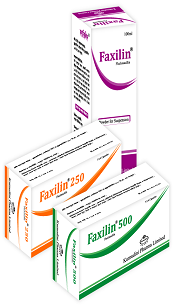 Flucloxacillin is indicated for the treatment of infections due to Gram-positive organisms, including infections caused by β- lactamase producing staphylococci. Skin and soft tissue infections: boils, abscesses, carbuncles, furunculosis, cellulitis; infected skin conditions, e.g. ulcer, eczema and acne; infected wounds, infected burns, protection for skin grafts, otitis media and externa, impetigo. Usual adult dose: 250 mg four times daily. In severe infections, the dose may be doubled to 500 mg four times daily. Side effects as with other penicillin’s, are uncommon and mainly of a mild and transitory nature. Gastro-intestinal upsets (e.g. nausea, diarrhea) and skin rashes have been reported. If a skin rash occurs, treatment should be discontinued. The administration of probenecid with Flucloxacillin results in higher pick serum concentrations and prolongs the time that therapeutic concentrations of Flucloxacillin are achieved in serum. Physical incompatibility and/or loss of activity of Flucloxacillin in solution have been reported when given with gentamycin sulphate, streptomycin sulphate & vitamin mixtures. Flucloxacillin should not be added to intravenous lipid, blood products and protein hydrolysates or other proteinaceous fluids.